The classic Sleeping Lulu is the perfect companion for your baby or toddler. 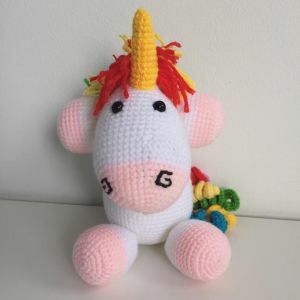 About 10 inches tall, it is made with milk cotton yarn and 100% polystrene filling so it is easily washable. 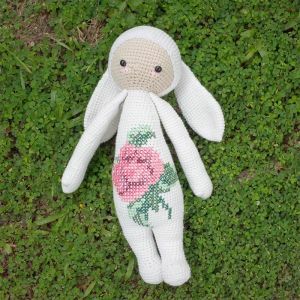 Sleeping Lulu is super huggable and makes a great decorative item for the nursery! It is the perfect gift for birthdays, baby showers, during Christmas and other occasions. Sleeping Lulu can be made in various colours of your choice. To clean, hand wash or machine wash on gentle cycle with cold water and mild detergent and air dry. Do not dry clean. Because every item is handmade, the end product may be slightly different in size and colour from the picture shown.